These are the coolest beads! 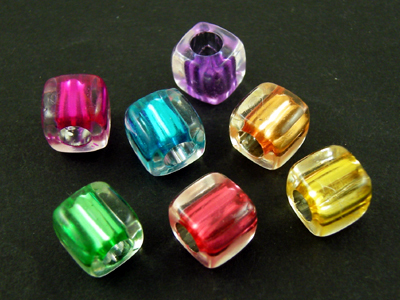 They are a transparent cube with an inside color (sort of looks like a bead in bead, really nice kind of iridescent). Our parrots love to lick and beak these beads and they are very difficult to pop and easy to restring! The 4mm hole is large enough for neon shoelace, paper rope, leather lacing, or paulie rope.